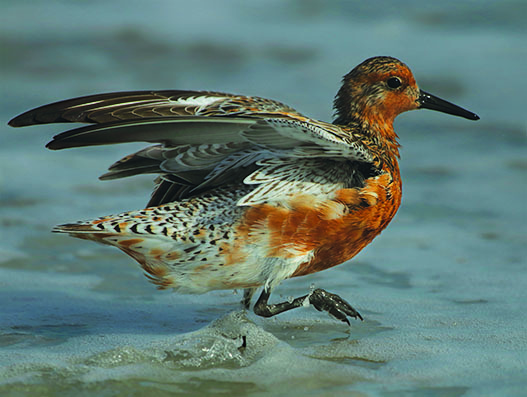 Share the post "Competition Between Oyster Aquaculture and Horseshoe Crabs Could Be Affecting Red Knot Foraging"
Red Knot (Calidris canutus rufa). Aquaculture is a burgeoning industry along the Delaware Bayshore, infusing millions of dollars and jobs into local economies each year. A particular area of growth over the last decade has been intertidal rack and bag oyster production of eastern oysters (Crassostrea virginica). 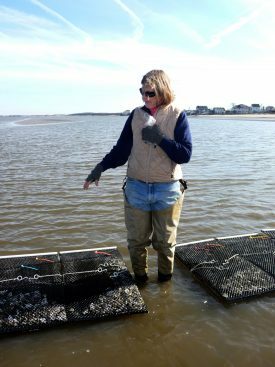 The majority of existing oyster farms in New Jersey are located along the Cape Shore region of Delaware Bay where oyster cultivation developed more than a century ago. The region is also an important stopover site for the federally listed red knot (Calidris canutus rufa), a shorebird that migrates from southern Argentina to breeding grounds in the Canadian Arctic. Red knots rely heavily on the lipid-rich eggs deposited by spawning horseshoe crabs in order to gain enough weight to complete their migration and begin their breeding season in the Arctic. Horseshoe crabs deposit eggs over a three- to seven-week window each spring, and red knots have evolved over millennia to time their migration and stopover to take advantage of this energetically rewarding food source during the brief period it is available. 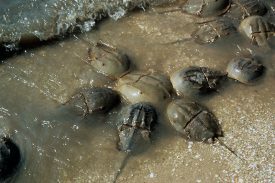 Overexploitation of horseshoe crabs and loss of spawning habitat have combined to reduce this critical food supply and is associated with recent declines in the red knot population. Intertidal oyster aquaculture occurs within portions of these same tidal flats. However, the potential impacts of oyster aquaculture activities on red knot foraging have not been quantified, severely challenging the development of oyster tending guidelines that would minimize negative impacts to red knots without compromising farm viability. A team of Rutgers scientists comprising Brooke Maslo, specialist in wildlife ecology; Joanna Burger, Rutgers Division of Life Sciences behavioral ecologist, affiliated with the Department of Ecology, Evolution, and Natural Resources (DEENR); Julie Lockwood, conservation biologist and professor in DEENR; and David Bushek, director of the Haskin Shellfish Research Laboratory, initiated an in-depth study to provide a baseline understanding of how intertidal rack and bag oyster aquaculture, as it is currently practiced, is affecting red knot foraging. Their research was funded in 2015 by the New Jersey Department of Environmental Protection and the National Fish and Wildlife Foundation. The team, which completed its first field season in 2015, is currently analyzing the data and has received two additional years of funding from New Jersey Sea Grant to continue the study. Their understanding will lead to the development of appropriate and effective protective measures for red knots and facilitate the exchange of information between the oyster aquaculture industry and governing agencies. This would promote modifications to current practices that will ensure the persistence and growth of a key industry in the region. Editor’s Note: This story first appeared in the 2015 New Jersey Agricultural Experiment Station Annual Report.